Apartment 2 fully equipped, air conditioning, kitchen with hob, oven, large refrigerator, dishwasher, and microwave bedrooms. Satellite TV, spacious bedrooms with fitted wardrobes and ceiling fans, bathroom modern design, large terrace of 40 m², table with chairs, umbrellas and hammocks. Located in the best urbanization of Vera Beach, next to the large pool used exclusively only for residents of urbanization. 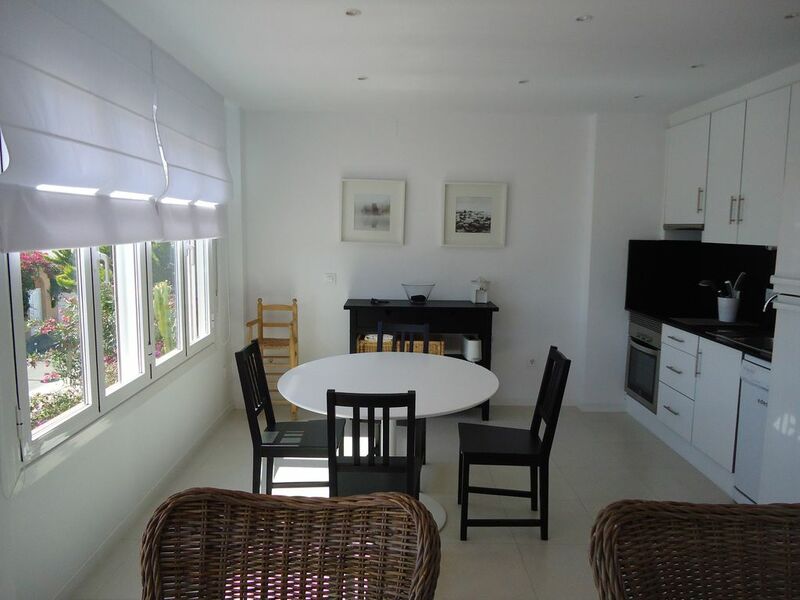 The apartment is fully renovated, modern air and very functional to spend holidays. It also has hot air system (heating), for use during the winter months. Available storage closet. From the terrace of the apartment is the sea. Located in a quiet area ideal for relaxing. Bathroom, brand new shower, the bathroom has a window to the outside. Apartment for four people, in quiet gated community, ideal for a couple with children during the summer season, and seniors throughout the year, especially during the fall, winter and spring, near the beach, with unparalleled weather throughout the year. Located in the urbanization Puerto Rey, near the beaches of Vera, known also by its length of more than 5 km and a width of 250 m. Urbanization Puerto Rey quiet residential area of ​​high standing, has a sports center, with 12 paddle tennis courts, 8 tennis, golf driving range, gymnasium and cafeteria. In Puerto Rey is a large swimming pool for residents only, playground and petanque. On the beach there are several bars where you can enjoy typical Mediterranean food. In an area of ​​5 km there are 5 golf courses. The town of Garucha is at only 15 min walk along the promenade of Vera, Garrucha is a marina and fishing, restaurants and shops. A 7 km from Puerto Rey is the town of Mojacar where you can enjoy its magnificent nightlife, beaches with typical bars, restaurants with all kinds of cuisine, Mediterranean and international. The pristine beaches of Almeria are a different paradise. Se pide un deposito de 300€, que se devolverá a la salida del cliente después de haber sido revisado el apartamento.